[Updated at 7:00 p.m.] London's Gatwick Airport also announced late Sunday that no flights will operate out of the airport over a six-hour period early Monday due to an ash cloud from a volcano in Iceland. The affected flights are scheduled between 1 a.m. and 7 a.m. local time, the same hours Heathrow plans to stop service. [Posted at 6:34 p.m.] All flights going into and out of London's Heathrow Airport early Monday have been canceled due to a drifting ash cloud from a volcano in Iceland, a spokesman for the British Airports Authority told CNN late Sunday. The affected flights are scheduled between 1 a.m. (8 p.m. Sunday ET) and 7 a.m. (2 a.m. ET), said BAA Heathrow spokesman Andrew Kirton. 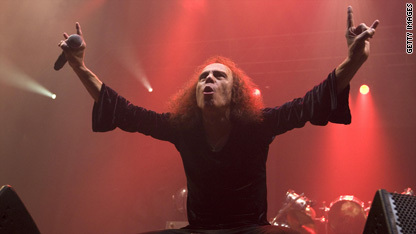 Heavy metal rocker Ronnie James Dio died Sunday morning after a battle with stomach cancer, his wife announced. "Today my heart is broken, Ronnie passed away at 7:45 a.m. 16th May," Wendy Dio said in a message posted on his official website. A Rhode Island high school that fired all its teachers in February has reached a tentative agreement with the school's teachers union to rehire them, the union announced Sunday. The school board of the Central Falls School District, outside of Providence, had voted to fire its high school's 93 teachers and administrators over low student performance. Two F-16 military fighter jets intercepted an ultralight aircraft that flew into Arizona from Mexico on Sunday and tracked it until the ultralight returned to Mexico, the North American Aerospace Defense Command said. A statement by the NORAD command center in Colorado said the ultralight crossed into U.S. airspace just after 6 a.m. Arizona time (9 a.m. ET). statement. No other details were immediately available. American Legion volunteers gathered Sunday at a neglected marble temple on the National Mall to commemorate veterans of World War I, at a site they hope will soon be a national memorial. Massive crowds turned out for Pope Benedict XVI's weekly address Sunday, following a call from the Italian Catholic Bishops Conference to support the pontiff. Al Qaeda in Iraq has named replacements for the top leaders killed in a U.S-Iraqi raid north of Baghdad in April, according to a statement posted Sunday on jihadist Web sites. More than a dozen acts will perform in Louisiana on Sunday to benefit the fishing industry threatened by oil gushing into the Gulf of Mexico. Filed under: BP • Gulf Coast Oil Spill • Showbiz • U.S.
Thirty men were arrested overnight into Sunday morning as they protested the removal of graves to make way for a hospital expansion in southern Israel. The South Korean Navy fired warning shots Saturday night after two North Korean patrol boats crossed into South Korean waters, state media said.